Summer is here! We have experienced the typical summer storms that surprise us as we begin swim and dive practice or prepare for our first grills and guitars. Don’t worry we have more planned later this summer. It is great to see all of our members enjoying the pool, playground, tennis court, tennis pavilion and the overflow grass area for kickball games and extra parking on weekends. As we begin another season there are a few things we need to remember. In the event of an emergency all emergency vehicles need to be able to access the neighborhood roadways and our property. If cars are parked on both sides of the road and the main entry way they will not be able to get through. We reached our membership cap goal of 450 full memberships again this year! We continue to have a waiting list for the 2019 season! Tennis Memberships are available. The initiation fee is $550.00 plus yearly dues of $550.00. If you have any updates for the directory or if your contact information has changed please contact Phyllis Smith at office@windyrush.com. We are excited about our new software system! Thank you for your patience during the launch of this new system. Soon you will receive an email with a user name and password from eSoft to update your information. We have tried to update information at the check in desk however this can be time consuming. It will be easier to have members update their own information and upload a picture for each family member. This will add another layer of protection to your membership and it will allow staff to recognize our members. Pat Dean is entering his 8th year as head coach at Windyrush. He has been involved at WR since 2005 as a coach and pool manager. His kids, Courtney, Camryn and Kenan have all swum for him at WR. Coach Pat has worked at CMS for 28 years, the last 10 at Carmel Middle School. Courtney Dean is entering her fourth year of coaching the Dolphins. She swam at WR for 10 years. Courtney just completed her freshman year at Costal Carolina University where she plays softball. Camryn Dean has been a member of the WR swim team since she was 7 years old. She has been coaching the Shrimpers for the past three years. She is a 2018 graduate of Sun Valley High School and will spend the next four years playing softball at UNC-Wilmington. Tyler Sherrill learned to swim at age 4 with the Shrimpers and won his first ever 3rd place “big kid” ribbon at age 6! Tyler swam competitively with SwimMAC for 10 years and recently exchanged his goggles for a baseball bat, making the Varsity team at school last year. 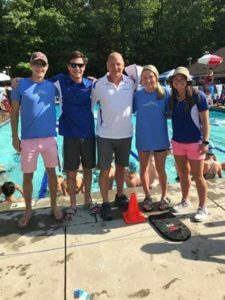 Tyler spent the past 2 summers life-guarding at the neighboring Candlewyck pool and is thrilled to join the coaching and the life-guarding staff at Windyrush this year! Tyler is an Eagle Scout and a rising Senior at Providence Day School. Carter Nelson started swimming for WR in 2007 as a Shrimper at the age of 5. He has participated on the WR swim team almost every summer since that year, has been part of the All-Star team multiple seasons, and currently holds a few Windyrush relay records with his teammates. He also swims for Covenant Day School and made States in the 100 Breast Stroke this past year. He is so excited to join the coaching staff this year and share his love of swimming with others! Diane Story has been Windrush’s Shrimper coach for 16 years. She has been teaching swimming for almost 30 years. Diane has two fabulous girls, Cara and Sophie. When she is not at the pool she is a middle school Science teacher. Cass Jackson is a rising senior in high school. She was a Shrimper with Coach Diane in ‘06 and ‘07 and began coaching in 2016. Cass also enjoys playing and teaching the piano and cello. Martha-Grace Jackson just completed her freshman year of high school. She has been on the Windyrush swim team since she was four years old and learned to swim with Diane Story. She is the second oldest of seven children. When she is not swimming, she enjoys playing the violin and piano. Megan Owens has grown up at Windyrush. She swam for WR during middle school. Megan is a graduate of Myers Park High School and is a junior at ECU majoring in Education. When she’s not coaching Shrimpers, she enjoys hanging out with friends and family. Warren Layne starting diving for Windyrush in 2005 when he was 7. He made the all-star team his very first year by mastering a reverse flip and continued to dive each year with the team until he aged out in 2016. Warren dove his freshman year at Myers Park High School, but did not return to the team because of conflicts with football and then injuries. Warren graduated from Myers Park in 2016 and is a rising junior at Appalachian State University. This is Warren's fifth year coaching Windyrush. Parker Pounds also joined our Diving Dolphins in 2005, and with her gymnastics background, her skill and grace has always impressed the summer judges. Parker was a Providence High School diver for four years. She graduated from Providence high school in 2016 and is a rising junior at the University of Georgia. This is Parker's fifth year coaching at Windyrush. She’s our dive sheet guru, making sure each of our athletes have the correct dives documented on their individual sheets before each meet. She is currently studying aboard, but will be home in time for the first meet. Both Parker and Warren qualified for the AAU Diving Nationals in 2012 after competing against and placing first over a number of year-round divers at a regional qualifying competition. Addie Layne has been diving for Windyrush for 11 years and has won numerous awards, including MVP; this is her third year coaching. Addie is a year-round level 5 all-star cheerleader who loves working with kids. Addie is a rising junior at Myers Park High School where she’s also a varsity cheerleader. Addie has been unable to dive for Myers Park since injuring her back her freshman year. 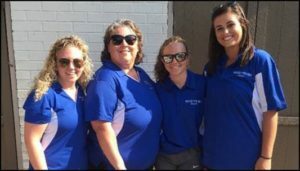 She recently had surgery, so unfortunately, she will not be diving for Windyrush this season, but looks forward to seeing and coaching all of the kids. Michael Smith started diving when he was five and has dove for Windyrush for nine seasons, making it to all-stars each year. He was MVP in 2007, 2010, and 2011. In 2012 he was the highest point recipient. Michael is a rising junior at Myers Park High School. He’s an outdoorsman who loves fishing, hunting, cliff diving and snow skiing. He’s a dare devil who loves performing and teaching tricks. He’s a snow skiing instructor who has coached kids in both winter and summer camps. Greyson Young started diving a few years ago when he just started trying things off the board in his free time. He was a natural, quickly picking up tricks and techniques by watching others. He’s competed summer league with Windyrush for two years and was award MVP in 2017. Greyson is a rising junior at Myers Park High School where he’s also a member of the dive team. A skilled swimmer (he swam for Windyrush for 11 years; 3 of those years he was a competitive year-round swimmer.) Outside of school, Greyson enjoys fishing, longboarding, biking and playing video games. New this year-Private diving lessons! Windyrush will be offering private diving lessons with our coaches. Since we will be closing the boards / dive well to members for these lessons, we've select three specific times each week beginning now through the end of the summer. There will be SEVEN slots per 30 minutes, one for each coach ( Warren, Parker, Addie, Michael, Greyson, Luke, Ethan). Each 30-minute session is $20, and you will pay the coaches directly. Lessons will be offered on a first-come, first-served basis, so if you are interested, send me an email -- please do not reply to this one -- with "Private Lesson Request" as the subject line. You can request a specific time and a specific coach. I will work back with the coaches to confirm their schedule and will then send you a confirmation. 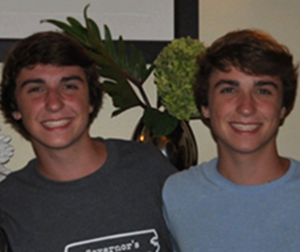 Luke and Ethan Foster started diving three years ago as exhibition divers at Windyrush. With strong tumbling backgrounds, the twins mastered the 1 meter board in no time, wowing summer league competitors and audiences with their amazing twisting skills. 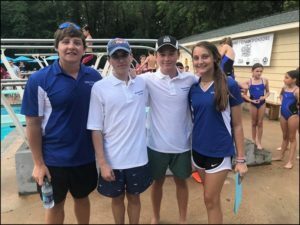 Now rising seniors at South Mecklenburg High School, Luke and Ethan have participated on their high school dive team the past three years and have been diving year-round for nearly two years. Luke placed 2nd at AAU Nationals on the 3 meter board and 3rd on the 1 meter board. He’s a member of his school’s Odyssey of the Mind club and he plays saxophone in the high school band. Ethan placed 1st in the NCHSAA 4A West Regional Championships this year. He also plays the viola in the South Mecklenburg orchestra. Swim lessons with Ms. Diane! Contact Diane Story 704-840-4437 or diane.story@cms.k12.nc.us for inquiries and sign ups! Interested in working at the welcome desk to check in members and guests this summer? We are looking for an adult attendant (age 18+) to work Friday through Sunday and holidays from 11am-7pm. If you are interested please contact Phyllis Smith at office@windyrush.com for an application. 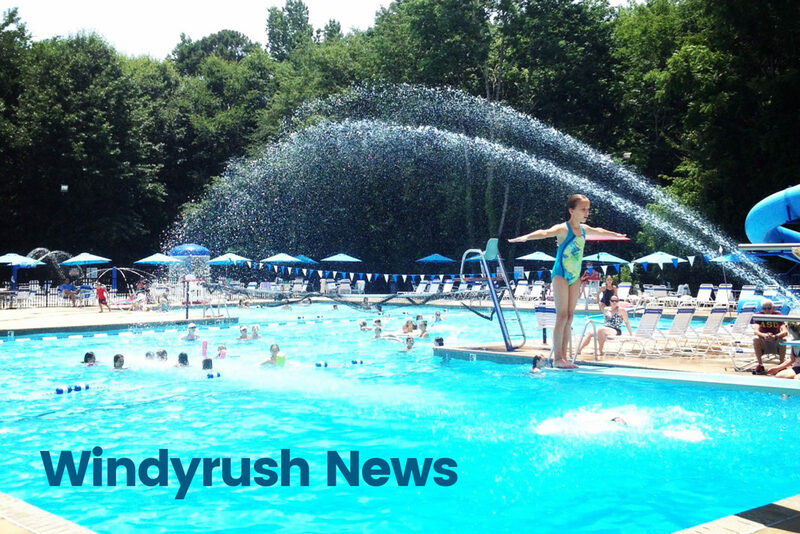 Interested in Lifeguarding at Windyrush? Please remember glass is NOT allowed on the pool deck. This includes glass inside coolers or in a pool bag. Please cover can drinks with a koozie. We have some extra koozies on site, please ask a lifeguard if you need one. Smoking is prohibited on Windyrush property. The overflow parking in the lower grass area will be opened and monitored by staff and the Board. This area will be used for swim meet parking and holidays as weather permits. As a convenience members may purchase guest passes. Guest passes may be purchased at the lifeguard desk. The software system will keep track of the pass visits. Every Monday, Wednesday and Friday 6am-8am beginning in June. Masters Swim is adult lap swim. You may come anytime between 6am and 8am and it's free for members! Guests are $5.00. Diner cards are laminated cards that you may purchase for snack bar use. Great for your children to use instead of carrying cash to the pool! Credit card purchases must be $10 or more, cash and checks accepted. Wellllll. As I continue to get more acquainted with Windyrush, I've noticed the patterns of play. The men, the ladies, the leagues, the ladders. What I'm uncertain about is the social events. While the courts are active during the above mentioned groups, I wonder what ideas you, the members might have. So. You all have my email tennis@windyrush.com. Most of the best programs I have run were brought up by members. Again, share your thoughts. Also the summer tennis program kicks off on June 11th. It promises to be a good, safe, fun, learning experience. Emphasis on fun! As summer begins remember to hydrate, and use sunscreen. Interested in using the ball machine? Contact Coach Mike Baldwin for instructions at tennis@windyrush.com. Yearly fee is $20. Tennis pavilion hours are 8:00am-10:00pm. Property gates are unlocked at 8:00am and locked at 10:00pm daily. If you would like to rent the tennis pavilion please contact the office for pricing. **Children should not be on the courts unless they are playing tennis. Children should NEVER be on the pavilion roof. Please let a staff member know if children are not following the rules. Guests must be accompanied by a member. Guest fees are $5.00 per guest. Please leave your guest fee payments in the box on the clay court entrancemarked “Guest Fees”.